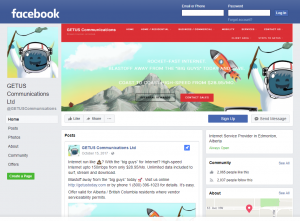 Facebook allows us to connect to our end-users on a unique, yet rewarding personal note allow us to answer common queries! Connect us with us on Twitter @GETUSComm and we’ll follow you back too. Subscribe to our videos, we hope you get a laugh or two out of our commercials. 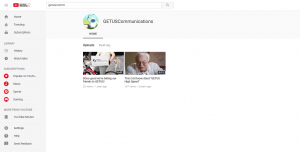 GETUS Communications Ltd Business #: 796 925 899-RT0001 | GETUS Communications Ltd also operates under “GETUS” and “GETUS COMMUNICATIONS”. Copyright 2015 - 2019 © GETUS COMMUNICATIONS Ltd. All rights reserved. Are you with Shaw, Telus or one of the "Big Guys" for internet? If so you're automatically qualified to switch to GETUS! 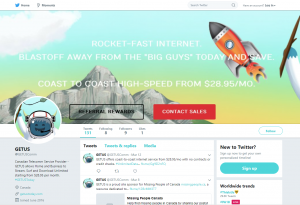 Rocket-fast, unlimited internet from $28.95/mo.